BACKGROUND AND PURPOSE: Bisphosphonates are drugs that decrease bone turnover by inhibiting osteoclast activity. An association between the use of bisphosphonates and osteonecrosis of the maxilla and mandible has recently been described. This study describes the imaging findings of bisphosphonate-associated osteonecrosis of the jaws. MATERIALS AND METHODS: This is a retrospective series of 15 clinically diagnosed patients, identified at 3 centers. Eleven patients were women, of whom 6 had breast cancer, 3 had osteoporosis, and 2 had multiple myeloma. Of the 4 male patients, 2 had prostate cancer, 1 had multiple myeloma, and 1 had osteoporosis. The age range of the patients was 52–85 years (average, 68 years). The mandible was the clinical site of involvement in 11 patients, and the maxilla was involved in 4 patients. Imaging consisted of orthopantomograms in 14 patients, CT scans in 5 patients, and radionuclide bone scan in 1 patient. Nine patients had sequential imaging. Two radiologists reviewed the images. RESULTS: All of the patients had a degree of osseous sclerosis, most commonly involving the alveolar margin, but lamina dura thickening and full-thickness sclerosis were also observed. The sclerotic change encroached on the mandibular canal in 3 patients. Less commonly encountered findings included poorly healing or nonhealing extraction sockets, periapical lucencies, widening of the periodontal ligament space, osteolysis, sequestra, oroantral fistula, soft tissue thickening, and periosteal new bone formation. CONCLUSIONS: The most common finding in bisphosphonate-associated osteonecrosis was osseous sclerosis. This varied from subtle thickening of the lamina dura and alveolar crest to attenuated osteopetrosis-like sclerosis. Bisphosphonates, drugs that decrease bone turnover by inhibiting osteoclast-mediated bone resorption, are used to treat osteoporosis, Paget disease, pain from osseous metastases, and malignancy-related hypercalcemia.1 Recently osteonecrosis of the jaws has been associated with the use of bisphosphonates.2–8 Patients with bisphosphonate-associated osteonecrosis present with nonhealing extraction sockets and painful bone exposure.3,4 Because of the increasing use of bisphosphonates, these complications are now being encountered more frequently. Diagnosis of bisphosphonate-associated osteonecrosis is clinical, because it is preferable to avoid biopsy in patients taking bisphosphonates because of problems with healing postsurgical intervention.9 As a result, radiology is likely to play an increasing role in confirming the diagnosis. This study describes the imaging findings of bisphosphonate-associated osteonecrosis of the jaws. Institutional review board permission was granted for this retrospective study of 15 patients taking bisphosphonates who developed osteonecrosis of the jaws that was diagnosed clinically. Patients included in this study were those currently receiving bisphosphonate therapy who developed painful dental conditions requiring management by an oral and maxillofacial surgeon. This included patients with painful bone exposure, nonhealing extraction sockets, and infection difficult to manage with conventional therapy. The patients were identified at 3 centers. A chart review was performed to document the clinical details. Two radiologists reviewed the imaging of the jaws in consensus, which consisted of orthopantomograms in 14 patients, CT scans in 5 patients, and radionuclide bone scan in 1 patient. Nine patients had sequential imaging. Eleven patients were women, of whom 6 had breast cancer, 3 had osteoporosis, and 2 had multiple myeloma. Of the 4 male patients, 2 had prostate cancer, 1 had multiple myeloma, and 1 had osteoporosis. The age range of the patients (at the time first seen by oral and maxillofacial surgeon) was 52–85 years (average, 68 years). The mandible was the clinical site of involvement in 11 patients, and the maxilla was involved in 4 patients. Clinical data from the 15 patients are shown in Table 1. Diagrams of normal orthopantomogram appearance and mild and advanced bisphosphonate-associated osteonecrosis are shown in Fig 1A–C. All of the patients in our study (15 patients) had a degree of osseous sclerosis, most commonly involving the alveolar margin (10 patients; Fig 2), but lamina dura thickening (7 patients) and full-thickness sclerosis (6 patients) were also observed (Figs 3 and 4). The sclerotic change encroached on the mandibular (inferior alveolar) canal in 3 patients. Five patients had poorly healing or nonhealing extraction sockets and periapical lucencies. Four patients had widening of the periodontal ligament space and osteolysis (Fig 5), 3 patients had sequestra (Fig 6), and 2 patients had oroantral fistula. Single patients had soft tissue thickening and periosteal new bone formation. The frequency of radiographic findings is shown in Table 2. The single patient in our series who had technetium Tc99m hydroxymethylene diphosphonate (Tc99m-HDP) bone scan imaging had 2 examinations separated by 3 years and demonstrated progressively increased radiotracer uptake around the extraction socket in the right posterior mandible. 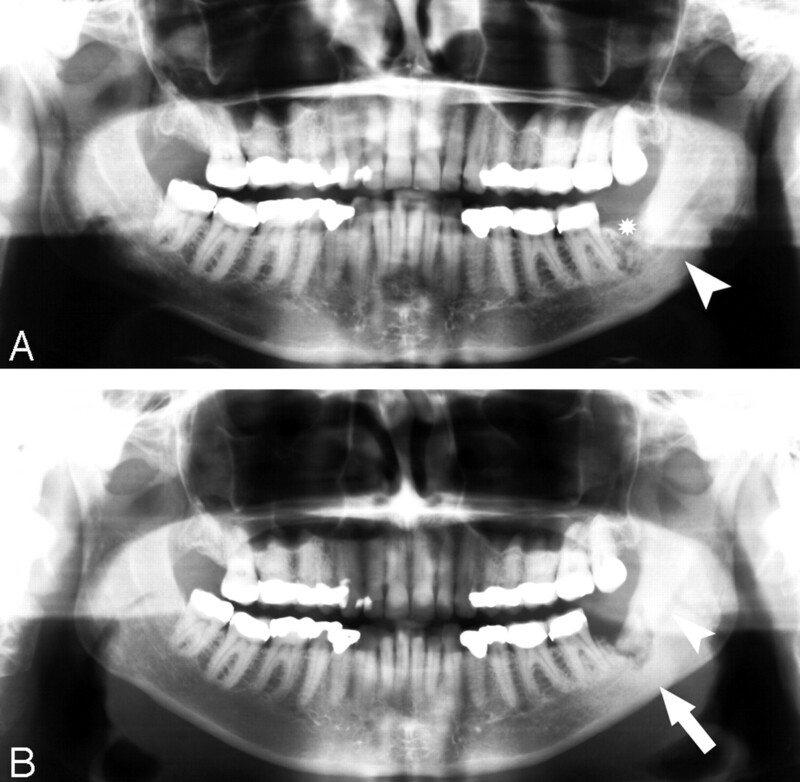 Radiographic findings in bisphosphonate-associated osteonecrosis of the jaws. A, Normal: the alveolar crest of the jaws is the cortical bone of the alveolar margin in between teeth and is continuous with the lamina dura around the root of the tooth. The 1- to 2-mm lucency between the root of the tooth and the lamina dura corresponds with the space for the periodontal ligament. B, In our series, osseous sclerosis was most commonly involved in the alveolar margin and lamina dura. The sclerotic changes were often diffuse rather than localized to the area of clinical involvement. C, In the patients with sequential imaging, the sclerotic changes were often progressive and may encroach on the mandibular canal. The sclerosis of the medullary cavity may be attenuated and reminiscent of osteopetrosis. 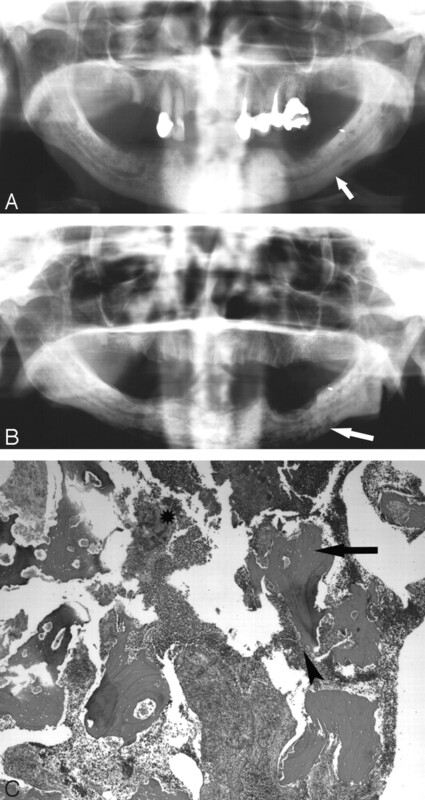 A 65-year-old woman (patient 1 in Table 1) with multiple myeloma treated with zoledronate presented with a nonhealing extraction socket in the left posterior maxilla (second and third molars, black arrow). The orthopantomogram demonstrates generalized sclerosis of the alveolar margin of the mandible (white arrows) and the maxilla to a lesser extent. There is also thickening of the lamina dura. A 67-year-old woman (patient 2) with metastatic breast cancer treated with pamidronate and later zoledronate presented with a nonhealing extraction socket. A, The orthopantomogram demonstrates the nonhealing extraction socket in the right posterior mandible (*) with sclerosis in the adjacent body and ramus of the mandible (arrow) and generalized thickening of the lamina dura in the mandible (arrowhead) and maxilla. B, Axial CT demonstrates the osseous sclerosis, as well as narrowing the mandibular canal (*), thin periosteal new bone anteriorly (arrow) and generalized thickening of the lamina dura in the mandible (arrowhead). C, Tc99m-HDP bone scan demonstrates increased radiotracer uptake in the right hemimandible corresponding with the area of sclerosis, which had increased over the last 3 years. A 60-year-old woman (patient 3) with widely metastatic breast cancer treated with pamidronate presented with a nonhealing extraction site in the left posterior mandible. A, Orthopantomogram demonstrates the nonhealing extraction site in the left posterior mandible (*) and sclerosis of the left ramus and angle of the mandible (arrowhead). 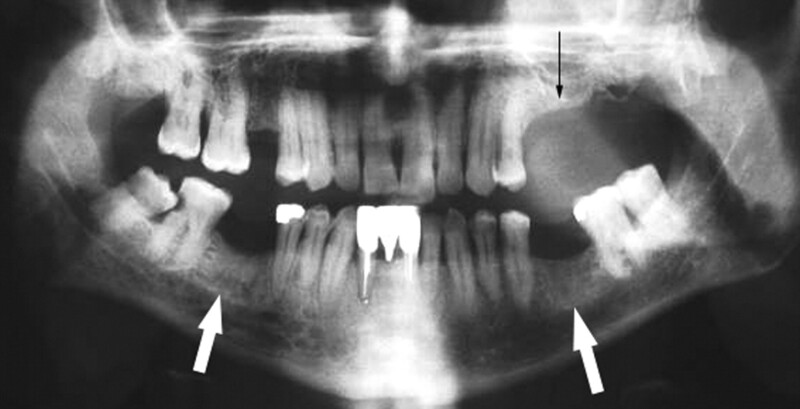 B, Orthopantomogram, 23 months later with intervening curettage, demonstrates disorganized bone formation in the extraction socket of the lower left third molar, progressive sclerosis of the left ramus, and angle of the mandible (arrow) with further encroachment on the left mandibular canal (arrowhead). A 77-year-old woman (patient 4) with multiple myeloma initially treated with pamidronate and subsequently zoledronate. A, The initial orthopantogram demonstrates osseous sclerosis (arrow). B, Orthopantomogram 9 months later demonstrates lytic destruction of the mandible, most prominent in the left body of the mandible (arrow). Surgical debridement was performed. C, Photomicrograph at low power (×40) of the curettage specimen stained with hematoxylin-eosin demonstrates fragments of necrotic bone with empty lacunae (arrow). There is extensive infiltration with inflammatory cells with surface resorption of bone (arrowhead) and bacteria (*). A 64-year-old man (patient 5) with multiple myeloma treated with pamidronate and subsequently clodronate presented with sinusitis and chronic nasal infection. 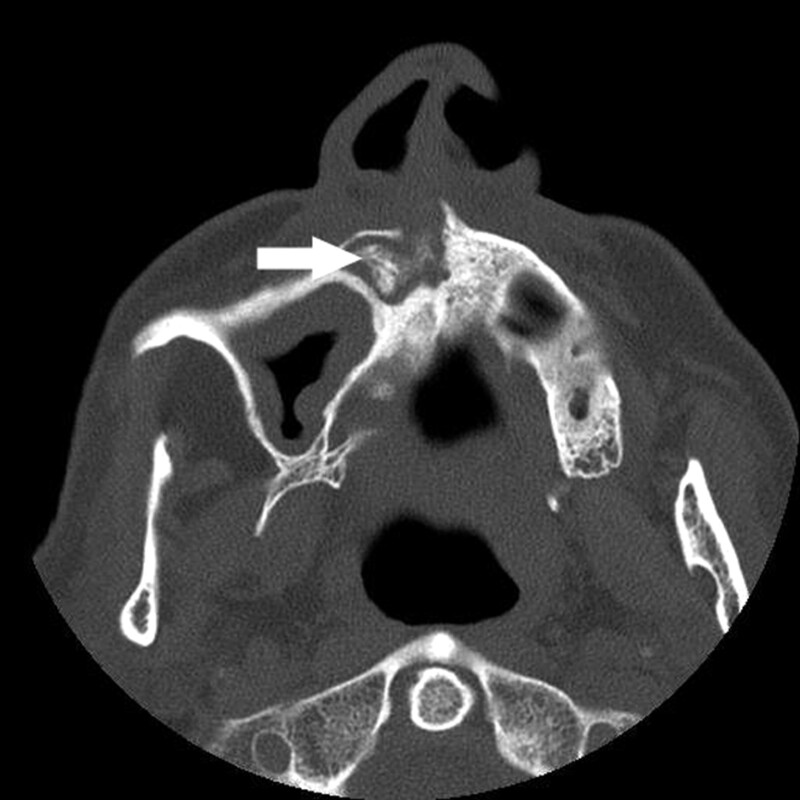 Axial CT demonstrates maxillary sclerosis, sequestrum (arrow), and mucosal thickening in the right maxillary sinus. Bisphosphonate-associated osteonecrosis of the jaws is a newly recognized entity,8 and formal diagnostic criteria have yet to be defined. The diagnosis of this entity relies on a characteristic clinical presentation of painful bone exposure (Fig 7), histologic evidence of osteonecrosis (defined as empty lacunae and calcified matrix/osteopetrotic change with or without bacterial invasion), the absence of any histologic evidence of neoplasm, and a history of use of bisphosphonates. However, the rigid application of these criteria poses a number of problems. First, cases of exposed bone are not always associated with pain. In addition, histologic confirmation of the diagnosis is not always possible, as a biopsy is often avoided because these patients have problems with healing. Hence, biopsy is recommended only when there is high clinical suspicion of metastasis.9 The diagnosis of osteonecrosis is, therefore, largely based on clinical criteria, with the key elements being an appropriate clinical presentation and bisphosphonate use. It should be noted that because the skeletal half-life of bisphosphonates is more than 10 years,1 it is possible that complications may occur after cessation of therapy. A 61-year-old man (patient 6) with metastatic prostate cancer treated with zoledronate presents with painful bone exposure of the right mandible (arrow). The most commonly encountered radiographic finding in our series was osseous sclerosis, which was present in all 15 of the patients to a variable extent. The normal radiographic appearance of the alveolar crest is of a sharply defined thin radiodense line that is continuous with the lamina dura around the root of the tooth, also a thin, well-defined line. 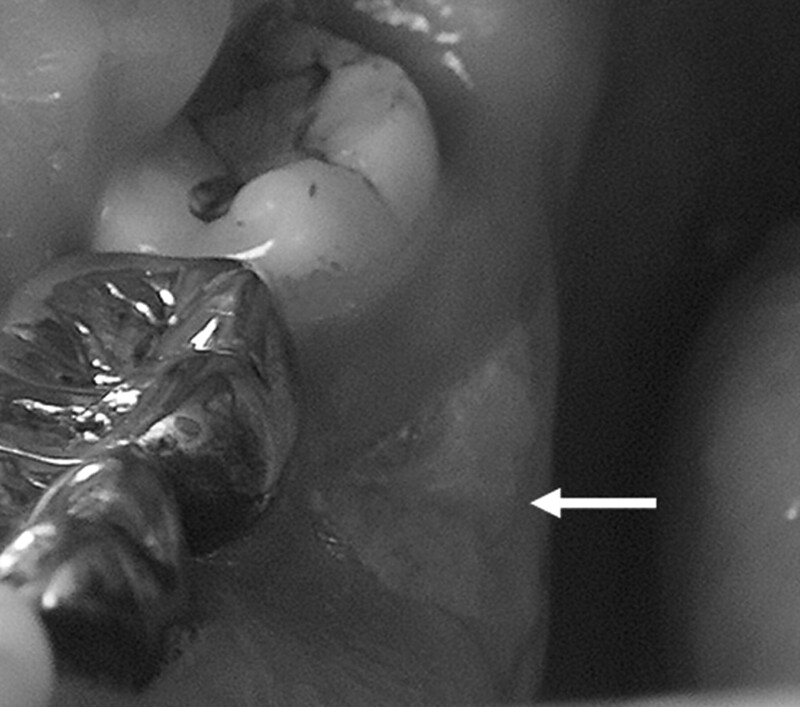 The 1- to 2-mm lucency between the root of the tooth and the lamina dura corresponds with the space for the periodontal ligament.24 In our series, case subjects with mild involvement had sclerosis of the alveolar margin and thickening of the lamina dura. The changes were often diffuse rather than localized to the area of clinical involvement. More advanced case subjects had greater degrees of osseous sclerosis, which may be attenuated and reminiscent of osteopetrosis and may narrow the mandibular canal. In the case subjects with sequential imaging, the sclerotic changes were often progressive. The generalized nature of the sclerotic changes in the jaws in bisphosphonate-associated osteonecrosis helps to differentiate this entity from reactive sclerosis, which tends to be localized around inflammatory foci. The less frequently encountered findings in our series, such as osteolysis, soft tissue swelling, periosteal new bone formation, periapical lucencies, oroantral fistula, and sequestra, are likely to correspond with the presence of infection. In our series, 7 of 8 patients who had histopathologic assessment of their disease had changes of osteomyelitis. Although the histopathology of these patients demonstrates osteomyelitis, it is important to note that the oral cavity offers a unique microbial environment in which exposed bone is immediately contaminated with oral florae. Thus, bacterial colonies, as well as inflammatory infiltrates, are ubiquitous in oral necrotic bone such that differentiation between osteonecrosis and osteomyelitis can be muddled by this peculiarity. Our findings suggest that the radiographic appearance of bisphosphonate-associated osteonecrosis is in part determined by the presence of superimposed infection. This may prove to be a useful form of radiologic classification and correlates with a staging system proposed by Ruggiero.25 To our knowledge, there is little in the literature regarding imaging findings in bisphosphonate-associated osteonecrosis. Most authors describe lytic destructive changes, sequestra, and soft tissue swelling,3,7,26 though Marx et al4 refer to the entity as “bisphosphonate associated osteopetrosis,” making reference to sclerotic changes in the jaws. The radiologic differential diagnosis for bisphosphonate-associated osteonecrosis includes chronic sclerosing osteomyelitis of the jaws,27,28 osteoradionecrosis, metastasis, and Paget disease. Chronic sclerosing osteomyelitis of the mandible has the radiologic hallmarks of periosteal new bone, sclerosis, osseous expansion, and sequestra28 (Fig 8). 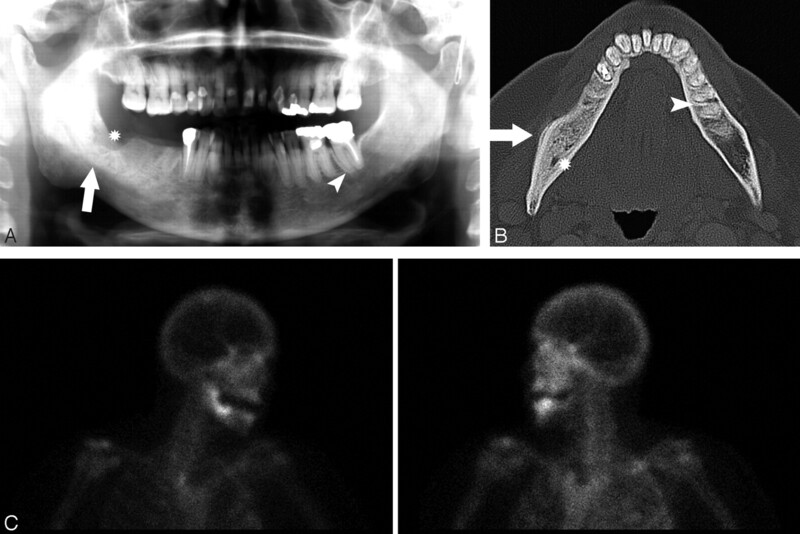 Osteoradionecrosis occurs after radiation therapy to the oral cavity and is radiologically manifested by poorly defined destruction of the mandible29 (Fig 9). Metastases to the jaws are uncommon and are most commonly found in the posterior reaches of the mandible. They are most frequently lytic lesions,30 with exceptions being prostate and breast cancer metastases, which may be sclerotic (Fig 10). Paget disease is typically manifest by osseous expansion and coarsened trabeculae. 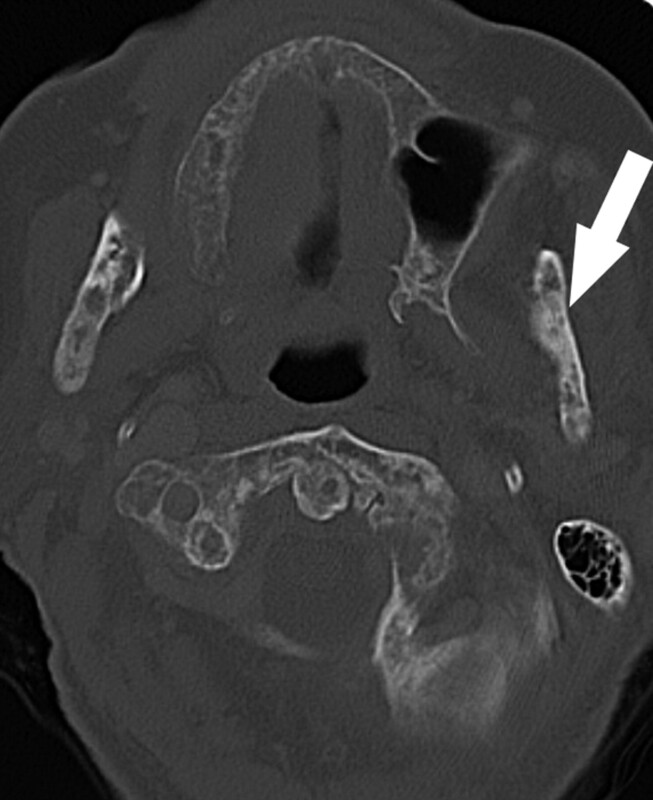 Coronal CT in a 7-year-old girl with sclerosing osteomyelitis demonstrates osseous sclerosis, remodelling, periosteal new bone (arrowhead), and soft tissue swelling (arrow). 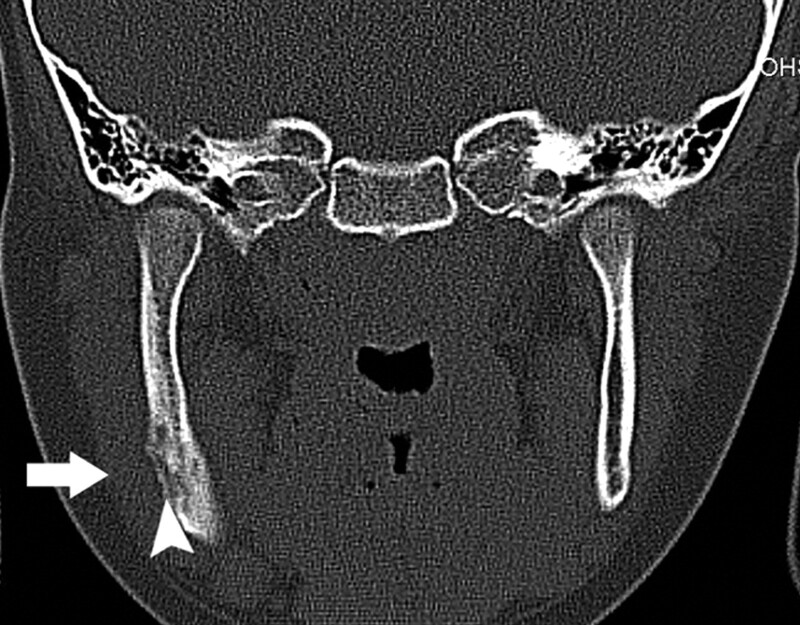 Orthopantomogram demonstrates mixed sclerotic and lytic destruction and pathologic fracture of the left body of the mandible (arrow) secondary to radiation osteonecrosis. Axial CT demonstrates mixed lytic and sclerotic (arrow) metastases in the mandible and cervical spine secondary to breast carcinoma. Note the cortical thinning related to the lytic lesions. The main limitation of our study is the small number of patients. Larger numbers are required before generalizations can be made regarding the typical radiologic findings in bisphosphonate-associated osteonecrosis. Another limitation in our study is the variability in imaging studies between patients, which makes it difficult to analyze the frequency of findings. CT is a more sensitive imaging technique compared with panoramic radiography; subsequently, findings such as soft tissue swelling, periosteal new bone, and sequestrum are easier to detect on CT and may not be seen on orthopantomography. Finally, because the clinical details were obtained from a chart review, some details, such as the length of time that subjects were treated with bisphosphonates, were not available. In our study, the most common finding in bisphosphonate-associated osteonecrosis was osseous sclerosis. This varied from subtle thickening of the lamina dura and alveolar crest to attenuated osteopetrosis-like sclerosis. It is important for radiologists to recognize this entity, because imaging is likely to play an increasing role in confirming the diagnosis, as there is a preference to avoid biopsy. We acknowledge Drs. Robin Cassumbhoy and Bernard Lim for contributing patients to the series, Dr. Jeffery Stewart for the provision of histologic sections, and Scott Jeffs for medical illustration. Paper presented at: Annual Meeting of the American Society of Neuroradiology, May 3, 2006; San Diego, Calif. Accepted after revision September 23, 2006.